Every single person who lives like an orphan does so from breach of trust. Their willingness to place their lives in God’s care and provision has been suspended. Pain facilitated that by unearthing their bad theology. Somewhere along the line, Satan introduced thoughts about God’s character, like ~ He’s not loving. He can’t be trusted. He doesn’t treat His children well. You’re better off taking care of yourself. What is the posture of someone who distrusts another? They back up. They reserve warmth. They keep thoughts private. They make a decision to need nothing from others. And this is where so many are with God. I lived there for a long, long time. God’s character needed defending and God used a few people in my life to do just that. They didn’t scold and confront my unbelief. In truth, they didn’t know what was going on in my heart. They just shared their own stories about God’s tenderness. They revealed portions of scripture that were not familiar to me about the heart of God and the heart of the scriptures. Slowly, my skepticism cracked and childlike trust emerged. I dared believe in the goodness of God toward me. I personalized the good news of the Gospel. As trust in God grew, I was willing to step away from the safety of orphan thinking and risk trusting Him enough to live as His daughter. I’ve been asked repeatedly about this ministry. 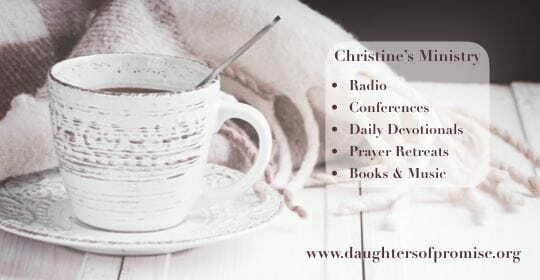 I answer that Daughters of Promise teaches women how to live as God’s child. This is really a quick over-simplification. Really, this ministry reaches out to orphans, helps them identify the cracks in their faith and the places where they distrust God. Then, I have the privilege of telling stories and teaching the Word to highlight the beautiful character of God. I get to defend His heart and start the rewarding work of reconciliation. Women move from distrust to trust. This series is the perfect example of that mission at work. If your eyes have been opened to your orphan ways, mission accomplished. If hope for change and a different way of life has been stirred in your heart, mission accomplished. If you’re daring to believe that God really has been at work in your painful story, mission accomplished. And if you find yourself anxious to read about the characteristics of a spiritual daughter in the coming days, mission accomplished. And how I love what God has called me to do. How I love seeing you come alive. You know that I am never preaching at you. I’m sharing my own story and I pray that by doing that, you will have the courage to trust God for your own metamorphosis.